The Echinoblog: Hymenocera picta! The dreaded killer of Starfish! Hymenocera picta! The dreaded killer of Starfish! Greetings! We have just passed the July 4th holiday this weekend and so, I am playing catch up! Today some videos of a cool looking gnathophyllid shrimp that does TERRIBLE things to echinoderms! It attacks and eats sea stars! It is the Hannibal Lector of the asteroid world! And people have the temerity to call it a Harlequin Shrimp! In addition to the species below, they also apparently feed on the sand star Archaster as well as those tiny little asterinid sea stars that frequently turn up in aquarium tanks.. Feeding behavior is apparently quite brutal..as the little buggers will start on the armtip and work their way up to the rest of the body... bit by bit. ugh..
No wonder that starfish in the tropics are heavily dependent on armor to defend themselves.. 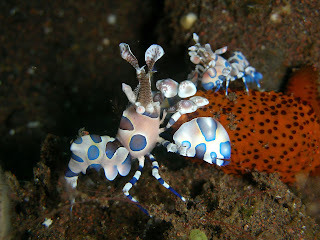 This one looks like either Linckia or Ophidiaster..
Harlequin Shrimp - Dinner Time from liquidguru on Vimeo. With more stuff next week or SOON! Depending on what comes next! Those are some surreal-looking crustaceans. They're even weirder than mantis shrimp! Thank you for the fascinating post and videos. Beautiful and terrible. thanks for the note! Glad to have you onboard!